"We are to walk about your gardens, and gather the strawberries ourselves, and sit under trees;—and whatever else you may like to provide, it is to be all out of doors— a table spread in the shade, you know. Every thing as natural and simple as possible." I couldn't get the titles to link.?.? Frozen strawberries make the best smoothies...just add milk and a bit of sweetener. Have a restful weekend. Hi Lori, the main heading includes all of the below in each title :) And yes, strawberries smoothies are the best!!! What a pretty, happy post! We love strawberries over a slice of angel food cake topped with real whipped cream. And strawberry smoothies are only made better by a 20 second squirt of chocolate syrup. O.O Homemade syrup is so good! I saved commercial bottles so I could squeeze my own. ;) My strawberries are nearly gone now. From one raised bed we got several quarts. I'm planning to expand to two beds for next year. Those labels are so nice, thank you! Beautiful post! My husband planted strawberries earlier this month. Strawberries usually produce sometime in June where I live. They are a favorite with my family. : ) I love all of the label resources you have shared. Thank you! Oh, I am SO thrilled to find a strawberry jam recipe that is made with honey!! HOORAY! Thank you for these wonderful recipes and also for the labels. We just went on a homeschool field trip to a local strawberry patch the other day, and oh, were they sweet and tasty! Makes me think of God's Word that says He satisfies our mouth with good things. He is so faithful! Oh, I love those strawberry labels! Next jam season, my labels are going to look so pretty! I will definitely need to try the recipe with honey too. Thanks for all the strawberry goodness! Jam making seems more fun with pretty labels, doesn't it? :) Have a lovely weekend! I enjoy making stuff with strawberries so need to try your jam with honey. I will eat strawberries some in desserts and jams/jellies but I do not care for them fresh. Hubby and son put a patch out last year so....am picking them now. I loved how you included quotes from lovely 'Emma'...one of my favourite parts of the book for it is, oh, so funny!! 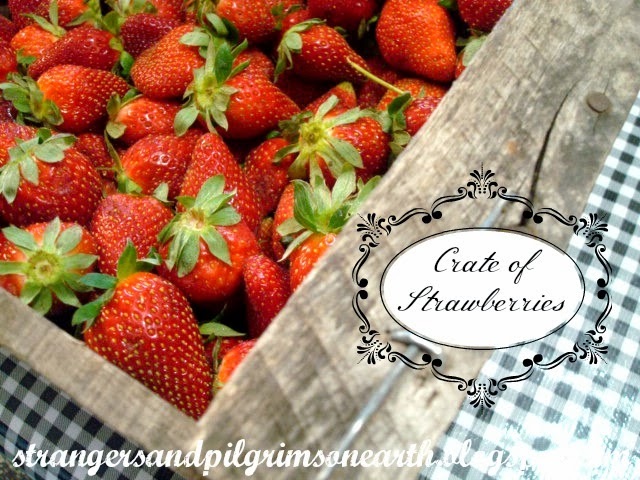 I would love to try a few of your delicious strawberry recipes...even though we are almost in winter here in South Africa, we have one or two strawberries gracing our plants...how odd and delightful is that?? Thank you for sharing your recipe and your beautiful labels too Jes! your post is so interesting and the labels for the jam jars are very nice !!!! Great strawberry post! 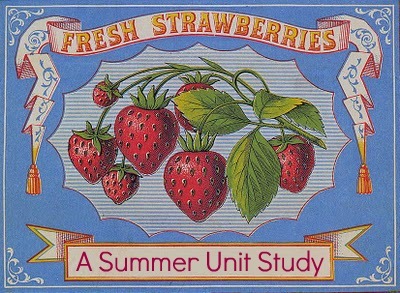 We have u-pick fields of strawberries in our area. We pick strawberries as a family & make homemade strawberry jam. Wonderful post on strawberries. We always have to purchase our strawberries and they won't be ready for another month at least. 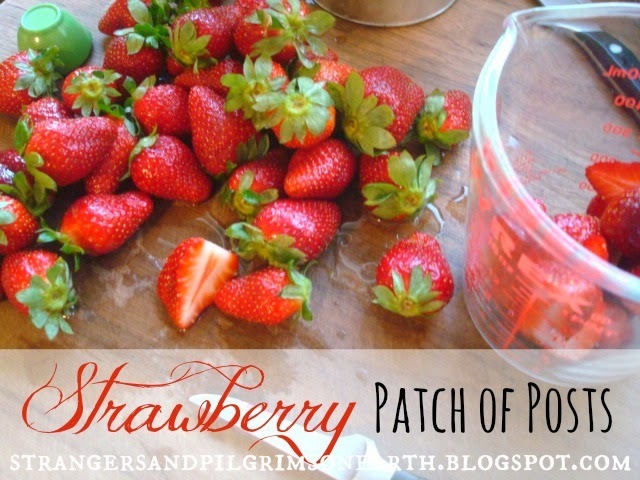 I always freeze them now, however I use to make strawberry jam and strawberry/rhubarb jam. Love them! Good post. :Love you printable labels. Thanks for sharing them. This is the season for strawberries. My husband loves them with just a little honey on and eating them from a bowl. Visiting from Homestead blog hop. Twitted. Hi Angela! :) I did get your precious comment and responded via email :) Perhaps I am in your spam box? I didn't publish it because I didn't know if you wanted your email public... Please let me know if you get it :) You are a sweetheart! Just making sure you received my email? Thanks! Great stuff JES! My strawberries are just coming out of hibernation. I can't wait! I just had to comment on this sweet strawberry post, since these berries are not only adorable, but extremely tasty and versatile, despite the fact that you have newer posts after it. 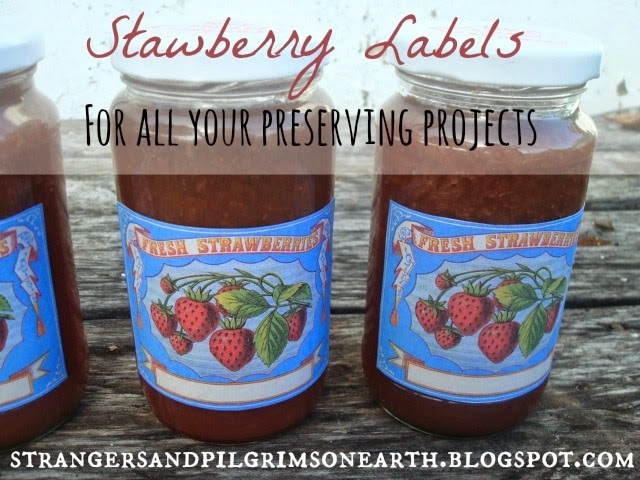 Charming pics of these petite pretties and their accompanying labels and recipes! Thanks for sharing and wishing you a warm and wonderful weekend!